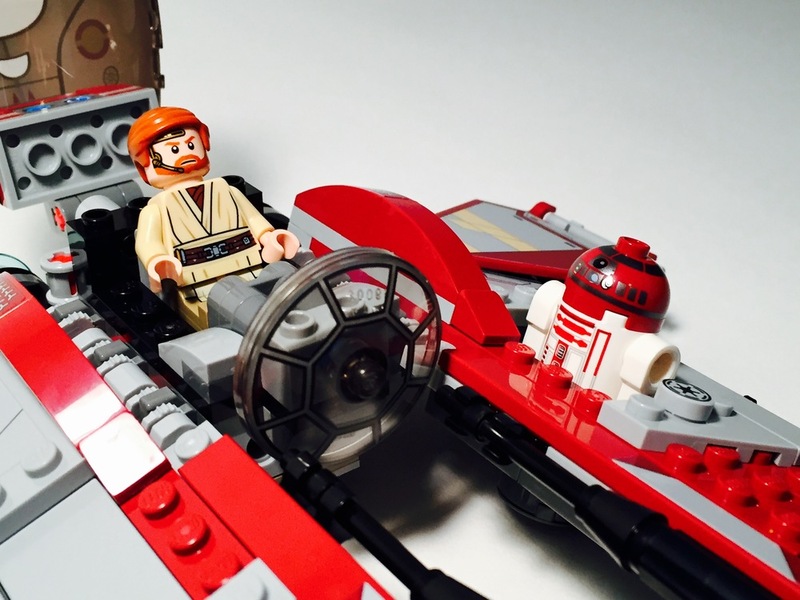 For a Jedi under the impression that “flying is for droids,” Obi-Wan sure has one heck of a sweet ride. 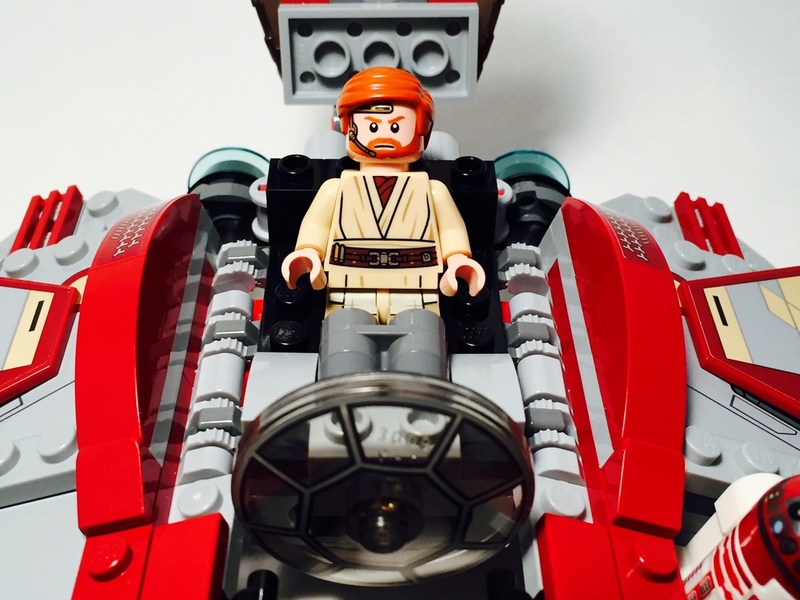 Obi-Wan’s Jedi Interceptor set is based on Obi-Wan’s vehicle heavily featured in Episode III of the Star Wars saga, Revenge of the Sith, and includes both Obi-Wan and his trusty astromech droid, R4-P17. The build of the Interceptor was more complex than I had anticipated, but in a great way. The main structure of the ship is comprised mostly of technic bricks and pins, and they make for an extremely sturdy foundation. In fact, the build is so solid I actually had a fairly difficult time disassembling the set, once I was ready to break the set down. It all makes for very solid, highly swoosh-able spaceship. The only downside to this set is the amount of large stickers which are included. The 4 jointed wings of the Interceptor each require the application of a large sticker on both the front and the back of the wing, which requires some patience to get just right. Nevertheless, once the stickers are actually applied, they do blend in very nicely with the overall design of the ship. As opposed to some sets where large stickers decrease the display-value of the build, these large stickers add an extra level of detail in wonderfully subtle way. 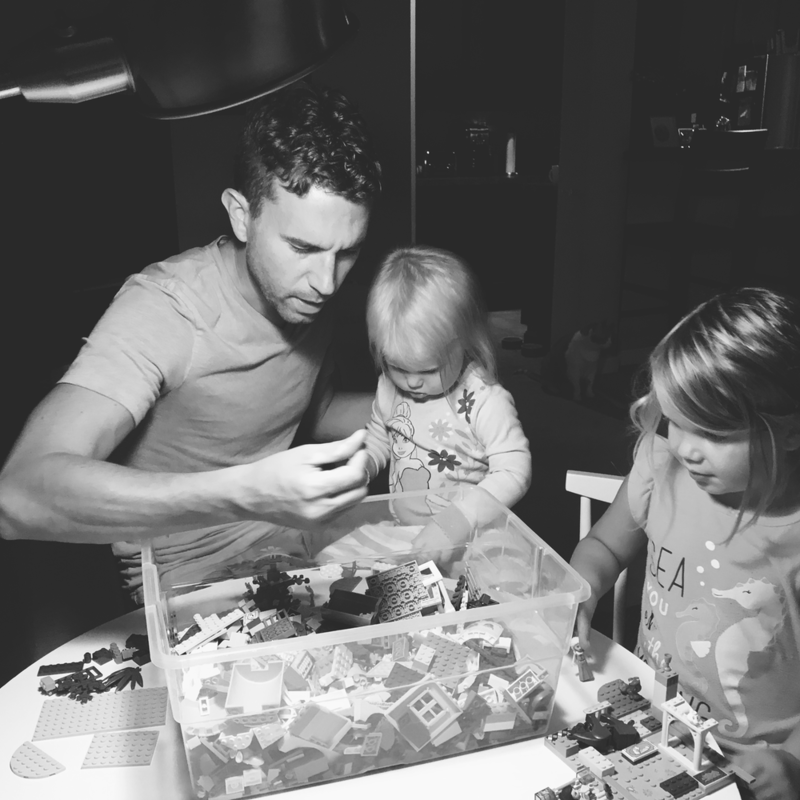 Perhaps, the best news for those of you Lego builders out there that have sticker-anxiety while assembling your sets [I know I do], the cockpit shield is a printed piece and not one large, scary sticker. The front of the cockpit is also a printed piece. Hallelujah! The play features of the set include a hinged cockpit shield, hinged wing tips, a spot for R4 to ride along with Obi-Wan, and two trans-neon green spring loaded shooters underneath the ship. The hinged wing tips allow you to customize the silhouette of the interceptor which makes for some really cool poses. The ship will not pose on its own with the bottom wing tips out, so you do have to come up with your own custom stand, if you want to display the ship with all the wing tips out. The only play feature missing [and categorizing it as a play feature might be a stretch] is a storage solution for Obi-Wan’s lightsaber when he’s manning the ship’s controls. 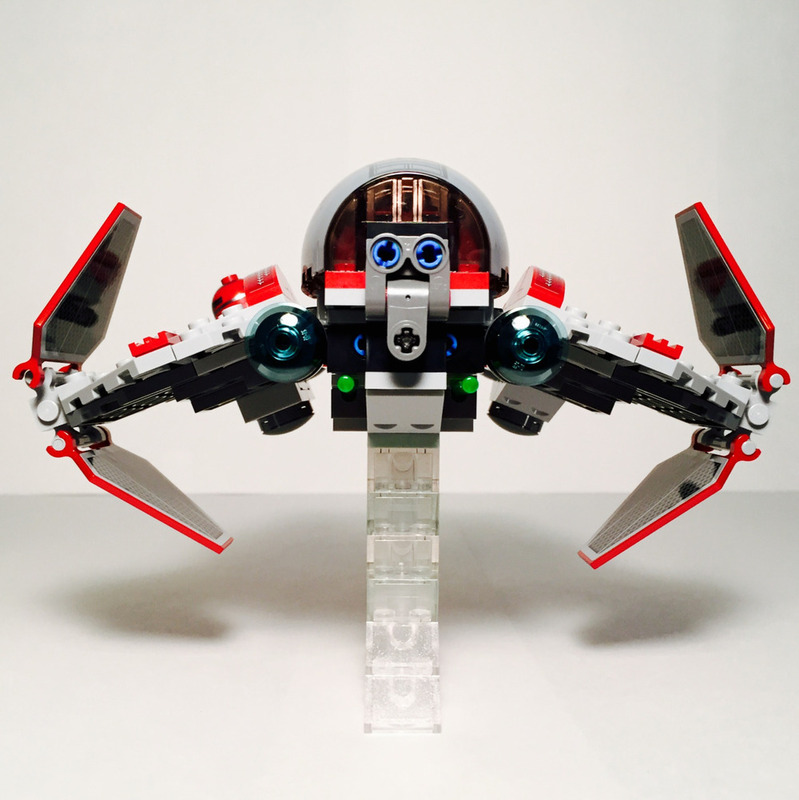 If you're interested in building the stand I created for the images above to display your own Jedi Interceptor set, please feel free to download the instructions here. It's an incredibly simple build, and you'll most likely have all the parts you need to throw this design quickly together. The interceptor set includes both Obi-Wan Kenobi and his astromech droid R4-P17. 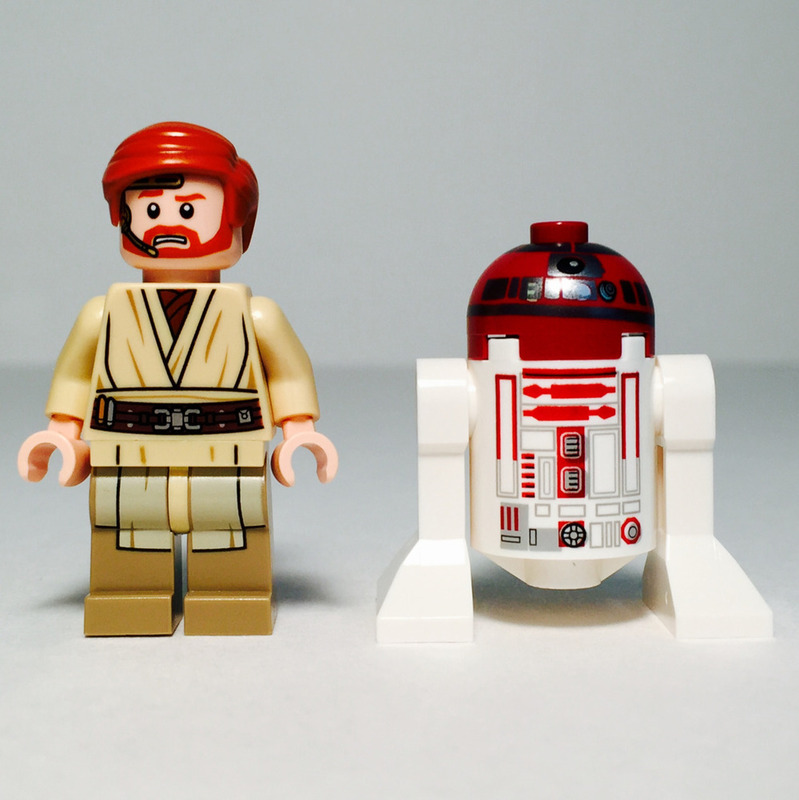 The Obi-Wan minifig includes two faces, both of which have a communicator mouth piece printed in gold to allow Obi-Wan to communicate to Anakin while soaring through the galaxy. Speaking of, the overall printing on Obi-Wan is just fantastic. Lego did a great job of continuing his robe print from his torso all the way through to his legs. 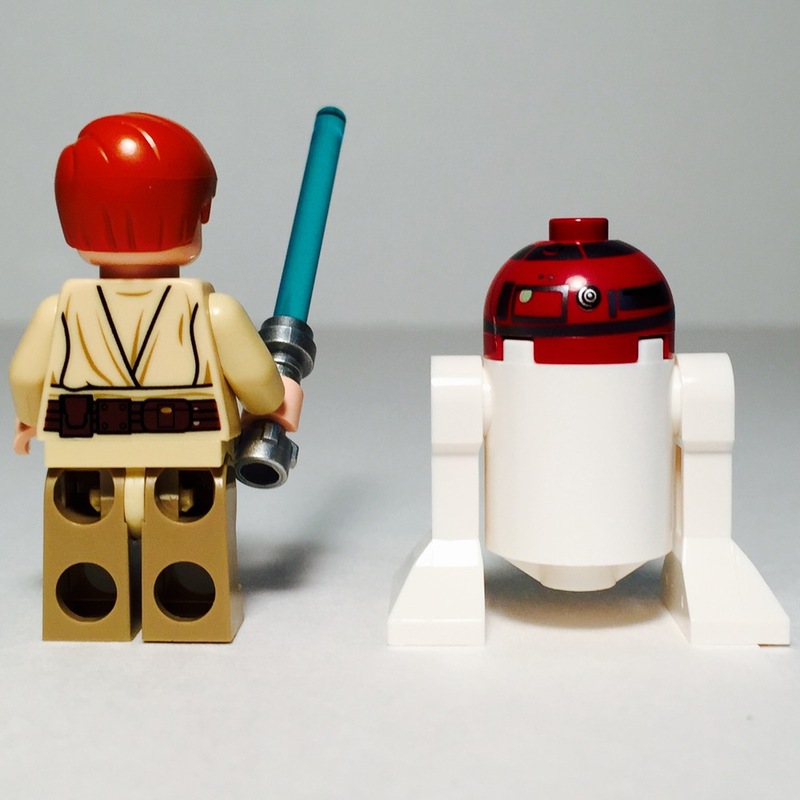 The R4 minifig is your standard Lego-ized astromech droid with red and gray accents which match the real in-universe R4 perfectly. 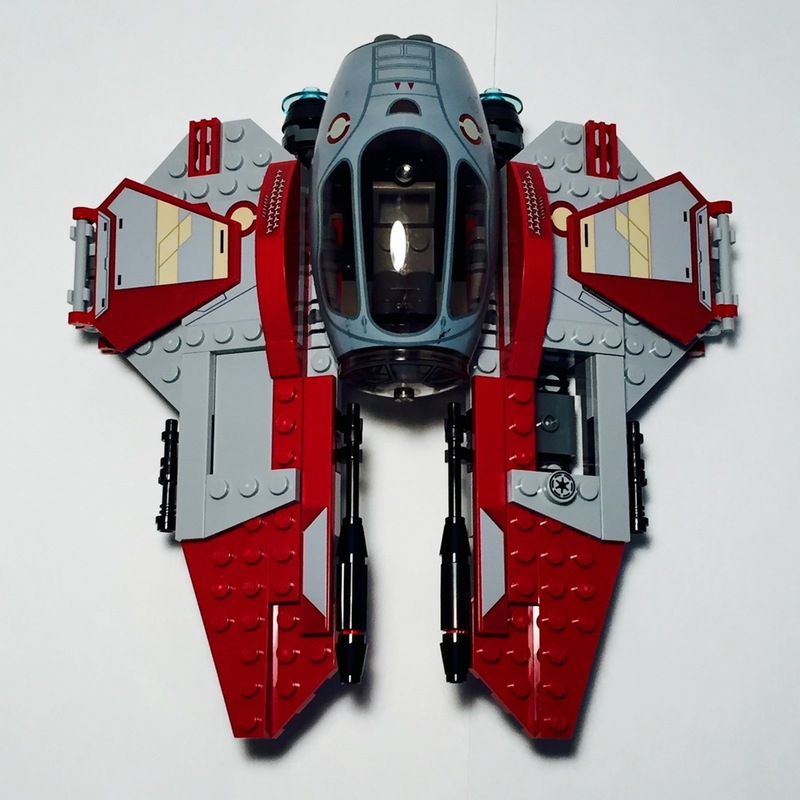 This is a great, affordable set for Lego Star Wars fans or for kids just looking for a fun swoosh-able space ship to fly around the house. You get a great ship, enough play features, and two wonderful Star Wars minifigs [especially the Obi-Wan] to make this set worthwhile and a good value. It also looks cool just sitting on a shelf [especially if you build your own custom stand to allow the ship to be displayed with all its hinged wing-tips out].